On October 27th, 2017, we held the inaugural SOIL SERIES art exhibition at the Empower Youth Ranch. The exhibition was the culminating endeavor of the first session of our Community Studio Program. The exhibition celebrated the efforts and perspectives of the Community Studio artists while unearthing latent histories, honoring local traditions, and offering new insights and possibilities for the future. Our first meeting with the assistant curators. The relationships we cultivated with Empower Youth’s summer interns during the renovation of the Barn Studio have become an enormous source of pride for us, and one of SOIL SERIES‘s greatest strengths. When we asked a group of our former interns to join us in mounting the exhibition as assistant curators, they enthusiastically agreed, even though it meant working late into the evening every day for two weeks. Under the guidance of Hillary, who acted as head curator, the interns cleaned and prepped the barn, assisted with curatorial decisions, and learned how to install artwork. We were so proud of the interns’ generosity, leadership, and teamwork throughout the process. Thank you to all our amazing assistant curators: Tristin Colson-Wright, Sydney Gee, Alec Guenther, Jasmine Ison, MacKenzie Johnson, Tyler Johnson, Hailey Jowers, Kayla Ragland, Ty Scott, and Olivia Taylor. On the day of the ribbon-cutting ceremony, community members came out by the hundreds to show their support of Empower Youth and to celebrate the completion of Peachie’s Place, Empower Youth’s new packing facility, named in memory of Peachie Glassmeyer. Speakers at the ceremony included John Essen of Community Savings Bank, Bethel Mayor Alan Ausman, and many more. We were especially thrilled to see Alec Guenther publicly recognized for his incredible dedication and hard work over the past year. After the ceremony, visitors gathered in the Barn Studio to view the SOIL SERIES exhibition. Upon entering, visitors were greeted with a map and a brief project description. Extensive wall texts placed throughout the space offered viewers further insight into SOIL SERIES and the projects on display. Nourishment is the key to everything we take on as a part of SOIL SERIES. Our project’s name is derived from soil classification terminology and points to our engagement with place down to the very fundamental level of the soil. […] We see this correlation between soil health and community health as having particular resonance in a community such as Bethel, with its rich agricultural history. Our goal with SOIL SERIES is to develop new nutritional pathways that address the holistic health of a community from its soil to its cultural and intellectual opportunities. Through our Community Studios, we have begun to provide cultural and intellectual nourishment to Bethel residents, offering a dedicated time and place for creativity, experimentation, and expression. In addition, we use our Community Studio lessons to connect the next generation of Bethel residents to the area’s rich past, providing historical references and opportunities for students to more deeply engage with their home through making. The artwork on display throughout the Barn Studio and “Peachie’s Place,” Empower Youth’s newly completed food packing facility, demonstrates our commitment not only to Bethel’s past, but also to its future, mirroring Empower Youth’s mission of hope for Bethel’s youth on all fronts. Below, we offer a brief overview of the works on display at the exhibition. We will also be detailing the works in more depth in later posts. As part of the exhibition we also shared some of our dreams for the future of SOIL SERIES and the Empower Youth Ranch. We displayed ideas and experiments, including an NFT (Nutrient Film Technique) hydroponics system, which we had started building with the help of our research assistants, Alec Guenther and Kayla Ragland. We were so pleased by the amazing turnout at the exhibition and the enthusiasm and support demonstrated by all who attended. The night was made all the more special by the incredible generosity of Chris Bean of Pneuma Coffee. “Pneuma” means “breath,” “air,” or “spirit” in Greek, and Pneuma Coffee is founded on the belief that “enjoying great coffee is like fresh air in the lungs of our social souls.” Chris uses his coffee business as a vehicle for building relationships and promoting compassion and community, which we can certainly say he did at our event. People queued up in a never-ending line all evening long for the delicious drinks Chris provided free of charge, yet he was present with each and every person who came to his counter. We even caught Chris giving lessons about the physics of latte art! Chris believes in the work of SOIL SERIES so much that he donated his time and his coffee to our event. We are overwhelmed with gratitude! 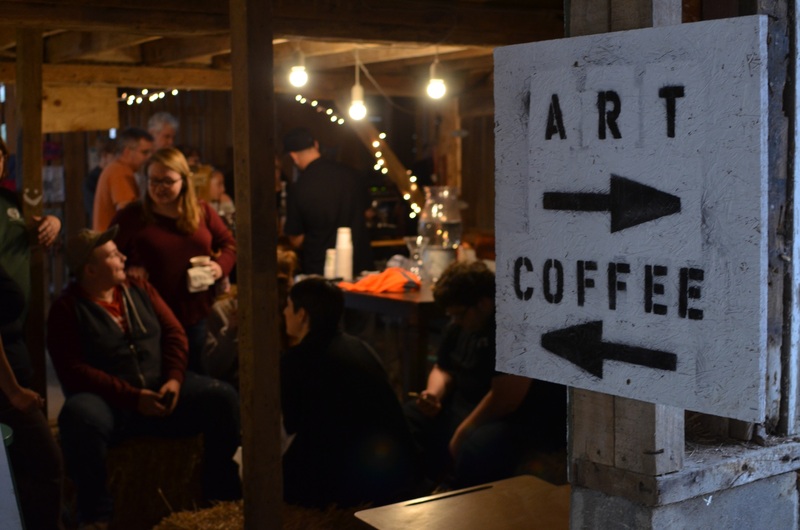 You can support Pneuma Coffee by visiting The 86 Coffee Bar and Concert Venue in Cincinnati, or by purchasing the company’s ethically sourced coffee online. We would also like to express our gratitude to all those who donated to and participated in our silent auction. We were touched by the outpouring of support from local individuals and business, and we are especially grateful to Empower Youth for making the auction possible. Proceeds from the auction will go directly to more Community Studio programming at the EY Ranch. We can’t wait to get started again in the spring! If you would like to support our efforts, please visit our Support tab, or click on the button below. Village Hardware, Joe Glassmeyer, Lisa Rose, Hairy Solutions, Wilson’s Auto and Truck Repair, The Creation Station, Stephanie Fiore, Bethel Feed & Supply Pet & Garden Center, FC Cincinnati, Newport Aquarium, Graeter’s Ice Cream, Domino’s Pizza of Bethel, Grammas Pizza of Bethel, Country Fresh Farm Market, Sweet Frog, Advance Auto Parts of Bethel, Tim Horton’s of Amelia, Pine Lane Soaps, Ben Franklin Store, Kim Dahlheimer, Clover Creek Pines Primitives (Amy Guenther), Sheila’s Fused Glass, Slime-Paluza, Cincinnati Arts Association, Laura Ormes, Judy Woodruff, and Just a Little Something (Janet Swarthout). Finally, a heartfelt thank you to all who attended the exhibition and contributed to the night’s success. This was the first time many of our Community Studio artists showed their work in public, and it was an absolute joy to share their pride in their accomplishments. We can’t wait to see what our artists do next! Stay tuned for news about upcoming programming and events, and follow our Facebook and Instagram for more updates and information.